SCVHistory.com | William S. Hart | Sorting Out Bill Hart's Siblings, by Rachel Barnes 2014. Education and Volunteer Coordinator, William S. Hart Museum. Thanks to the tireless efforts of the Hart Museum's Getty Multicultural Fellow Iona de la Torre, the museum has a better picture of the Hart family and a stronger understanding of who was who in the chaotic mess of Bill Hart's siblings. According to the U.S. Census of 1870 and 1880, the oldest of the Hart children was Nettie. She appears to have been born in 1860 or 1861 in New York, making her between 4 and 5 years old when her brother popped on the scene in 1864. This ties in perfectly with Hart's somewhat ambiguous autobiography, which references "my elder sister" (pg. 8) and "two foolish children" (pg. 2) relatively early in his reminiscences of life on the frontier. That also connects with the census data, which list Hart himself as the second child born to his parents, Nicholas and Roseanna — and oldest son. Next up, born around 1869, was sister Frances. She was born in Illinois, according to the census, and Hart mentions "stick(ing) pins in my new baby sister to hear her cry" (pg. 9) when the family was living in Aurora, Ill. Hart recalls the family's move to Aurora from Oswego, which is the town listed as the Hart family's place of residence in 1870 in the U.S. Census. Since Frances is listed as a 1-year-old toddler in the 1870 census, the baby sister Hart tortured with pins in Aurora was likely the circa 2-year-old Frances. Fast-forward again about two years to 1872, and another sister is born to the family. Her name is Mary Ellen. According to death records, Mary Ellen was born in Aurora. And again, this ties perfectly with Hart's broad-brush stores in "My Life East and West," since he vaguely recalls the family's move from Aurora to Rockford, Iowa, and then a move again to Tribell, Wis., which move "was during the night, and we children were carried by men who wore long blue army overcoats. … They made the entire journey to the depot … each with a child in his arms, while my father protected my mother and the youngest baby" (pg. 12). Portrait of Frances Hart, next born after Bill. Inscribed to their younger sister Mary Ellen (who lived with Bill and died in 1943): "With love to my sister Mary Ellen. Always affectionately, Frank(ie)." Photo: NHMLA Seaver Center. Click to enlarge. Consider then: Nettie, Bill and Frances were the three children carried by the "big stalwart men that had fought under Grant," and Mary Ellen would have been the "youngest baby" carried by Roseanna. "The little baby brother that I had been standing on my head for, and tickling with a feather to see him laugh, was quiet and still. His little crib … was covered over with a blanket and an Indian woman sat beside it all night and smoked" (pg. 19). Unfortunately, this was not the last child Roseanna would lose. Roseanna recovered, because it appears that while the family was still living in Trimbell, another baby boy was born. This baby appears to be Nicholas Jr. Shortly after his birth in or around 1875, however, Roseanna became severely ill, and the family moved to Prescott, Wis., to get her under the care of a physician. When the ministrations of the Prescott doctor failed to bring any improvement to Roseanna's health, Hart's mother, sisters and "the baby boy" went back to (Bill's birthplace), Newburgh, N.Y. The intrepid Bill stayed with his dad. When Roseanna and the children reunited with Nicholas and Bill, the latter were living in Minnesota. Hart mentions that his eldest sister — or as he calls her specifically, "the eldest girl" — had not returned to the frontier; she had stayed behind in New York with a grandmother to continue her schooling. But the other two sisters and the "little brother" had come back. Where are we in the timeline? Well, Hart mentions the Battle of Little Bighorn occurring not long after the newly reunited family settled in Zumbro Falls, Minn. This, then, would be around 1876. It was from Zumbro Falls that Bill, his mother and his siblings made the sad trip back to Newburgh when Roseanna again fell ill and required medical attention. Nicholas joined them "some months after" the family's return, and shortly thereafter, he found himself incapacitated in a work accident. It was while Nicholas Sr. was recovering from his catastrophic injury that young Nicholas Jr. — listed as a few months shy of 3 years old — passed away. He was buried in West Farms, N.Y. 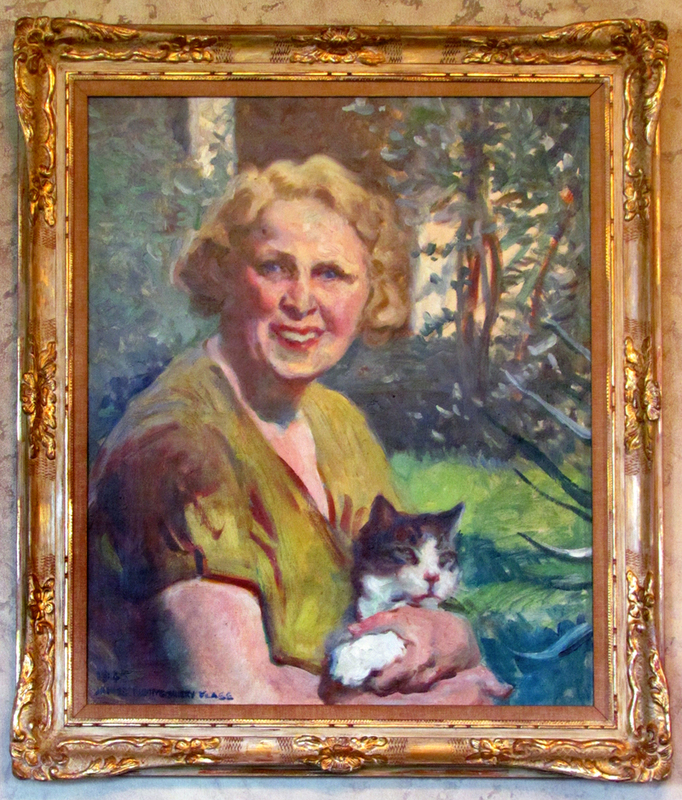 Portrait of Bill Hart's younger sister Mary Ellen. Click to enlarge. Nicholas recovered enough from his injury to return to work, and he continued to pursue his dream of the flour mill, even though the family was firmly back on the East Coast. He moved the Harts to New York City and made several trips out West pursuing his dream. As we know, however, he always came back heartbroken. While the family was in the Big Apple — the teenaged Bill working as a messenger boy and competing in foot races — "another baby came. … He was normal in every way, but the heroic measures used by the doctors in his delivery caused his death in a few hours" (pg. 86). And then, the "baby girl to whom I was later to be father as well as brother" (pg. 92) was born. Her name was Lotta. She was born in 1882. Bill is mum on any further siblings, and the census records we have accessed don't mention Lotta — although she is mentioned in death records — so it is probably safe to assume Lotta was the youngest child born to the couple. An interesting note is Hart's recollection of his father's death in 1895 and the knowledge that Nicholas would soon "see (Lotta's) little brothers and sisters" in Heaven (pg. 124). Although we can glean that Nicholas and Roseanna lost three baby boys in infancy and childhood, there is no mention or record of a lost baby girl. What happened to the surviving siblings? We know Lotta passed away young from typhoid fever — and according to her death record, it was in 1901, when she was 19. But Nettie? And Frances? Again, Bill's autobiography is not much help on the details. He mentions that "one of my sisters had secured employment in a dressmaking establishment; another had finished a course of instruction at Cooper Institute, where she learned telegraph operating, and had gone to work at the main office of a railroad company" (pg. 98). Considering there is no indication Mary Ellen ever worked in either of these capacities, chances are that Hart is referring to Nettie and Frances. Hart also mentions, in almost the same breath, that one of his sisters got married and that his mother was soon scrambling to cover for the loss of income from the sister's employment (pg. 99). Whether it is the same sister's husband Hart mentions a few days later — when the family moved West to Washington state so Nicholas could have one last shot at his flour mil — Bill was well into his stage career and working in Chicago at the same time — and stayed with the young couple for a short time — is conjecture (pt. 107). What is known is by the time of Nicholas' death in 1895, the only two girls living "at home" were Mary Ellen and Lotta. It is assumed, then, that both older girls were married. And they were married; that is for sure. Nettie married Charles Rudd, and the two lived at times in New York and New Jersey. If the couple ever had children, they were not reported on the census forms in 1905, 1920 or 1930. Nettie passed away in 1935 at the age of 74. 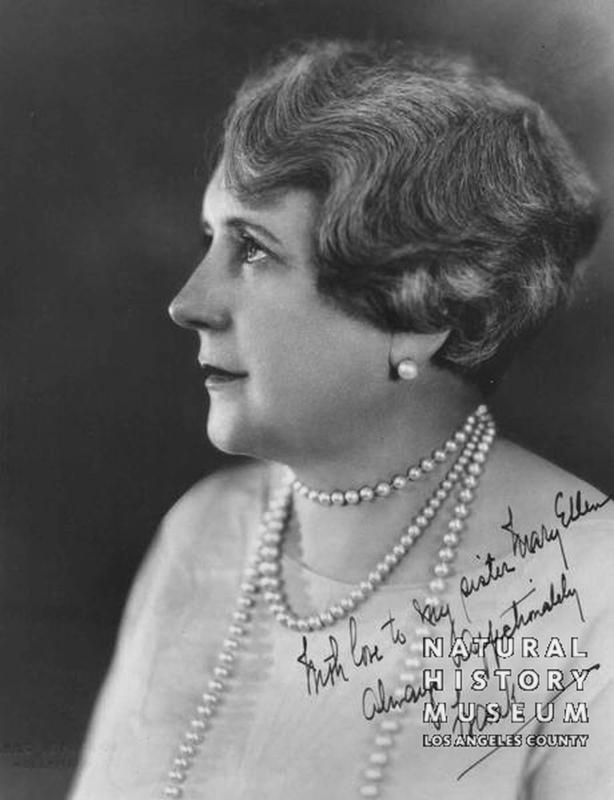 Frances married Albert Bierck and had one daughter, Beatrice, and two granddaughters, Beatrice (Tulipe) and Mary Ellen. Guess who the one was named for? Interestingly enough, Bill and Mary Ellen (the namesake) seem to have been closer to Frances than Nettie. We have pictures of Mary Ellen with another woman and two young girls. We have pictures signed "To Mary Ellen, with love, Frankie" (Frances' nickname) and letters from Bill stating that "Mrs. Bierck" helped her siblings move into their new mansion in 1927. And confirmation from Tulipe's son that his mom and aunt spent time with the Harts in California. We don't have much more information on Frances. She died in 1957 in Westport, Conn., from cancer, and she is buried in Lyndhurst, N.J. She was 88 when she passed. The last of the Bill Hart generation to go. So we may never know the full story of Hart's siblings. We may never find a true counting of all of the children born to Nicholas and Roseanna Hart. But each new piece of evidence does bring the picture into sharper focus. And that is what counts. 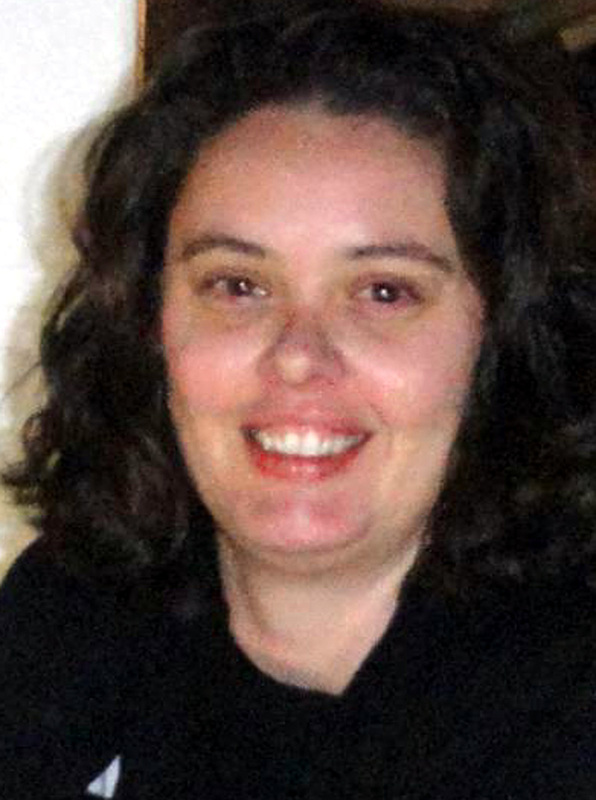 Rachel Barnes is the education and volunteer coordinator for the William S. Hart Museum, a unit of the Natural History Museum of Los Angeles County. 1. Hart, William S. "My Life East and West." Boston: Houghton Mifflin Co., 1929. 2. This line altered from the original story based on genealogical research by Tricia Lemon Putnam. Mrs. Frances Bierck, Sister of William S. Hart, Dies. Westport (Conn.) Town Crier and Herald | October 31, 1957. Mrs. Frances Victoria Bierck, 88, resident of Westport for the last 35 years, died Tuesday morning after a long illness at the home of her granddaughter, Mrs. James R. Cochrane Jr., Old Hill Rd. Services will be held at 11:30 a.m. tomorrow from Christ and Holy Trinity Church with the Rev. Frederic L.C. Lorentzen, pastor, officiating. 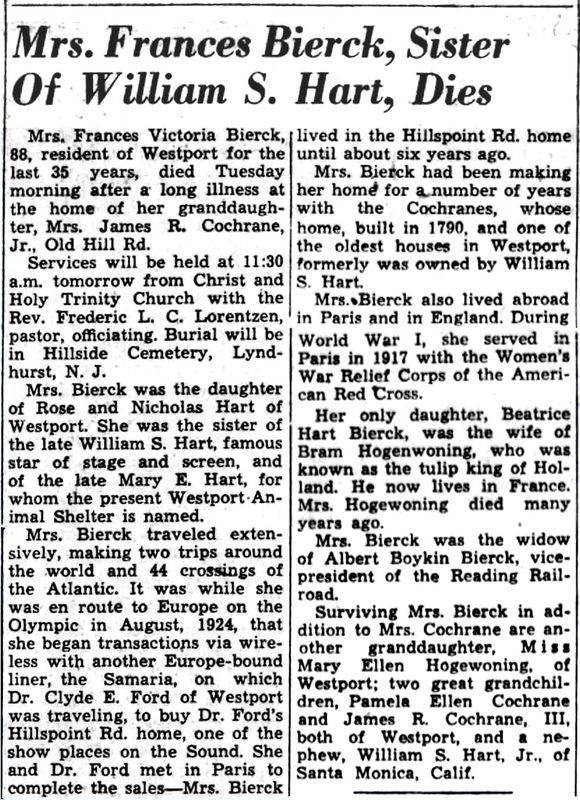 Burial will be in Hillside Cemetery, Lyndhurst, N.J.
Mrs. Bierck was the daughter of Rose and Nicholas Hart of Westport. She was the sister of the late William S. Hart, famous star of stage and screen, and of the late Mary E. Hart, for whom the present Westport Animal Shelter is named. Mrs. Bierck traveled extensively, making two trips around the world and 44 crossings of the Atlantic. It was while she was en route to Europe on the Olympic in August 1924 that she began transactions via wireless with another Europe-bound liner, the Samaria, on which Dr. Clyde E. Ford of Westport was traveling, to buy Dr. Ford's Hillspoint Rd. home, one of the show places on the Sound. She and Dr. Ford met in Paris to complete the sales — Mrs. Bierck lived in the Hillspoint Rd. home until about six years ago. Mrs. Bierck had been making her home for a number of years with the Cochranes, whose home, built in 1790, and one of the oldest houses in Westport, formerly was owned by William S. Hart. Mrs. Bierck also lived abroad in Paris and in England. During World War I, she served in Paris in 1917 with the Women's War Relief Corps of the American Red Cross. Her only daughter, Beatrice Hart Bierck, was the wife of Bram Hogenwoning, who was known as the tulip king of Holland. He now lives in France. Mrs. Hogenwoning died many years ago. Mrs. Bierck was the widow of Albert Boykin Bierck, vice-president of the Reading Railroad. Surviving Mrs. Bierck in addition to Mrs. Cochrane are another granddaughter, Miss Mary Ellen Hogenwoning, of Westport; two great grandchildren, Pamela Ellen Cochrane and James R. Cochrane III, both of Westport, and a nephew, William S. Hart Jr., of Santa Monica, Calif.
Obituary courtesy of Tricia Lemon Putnam. 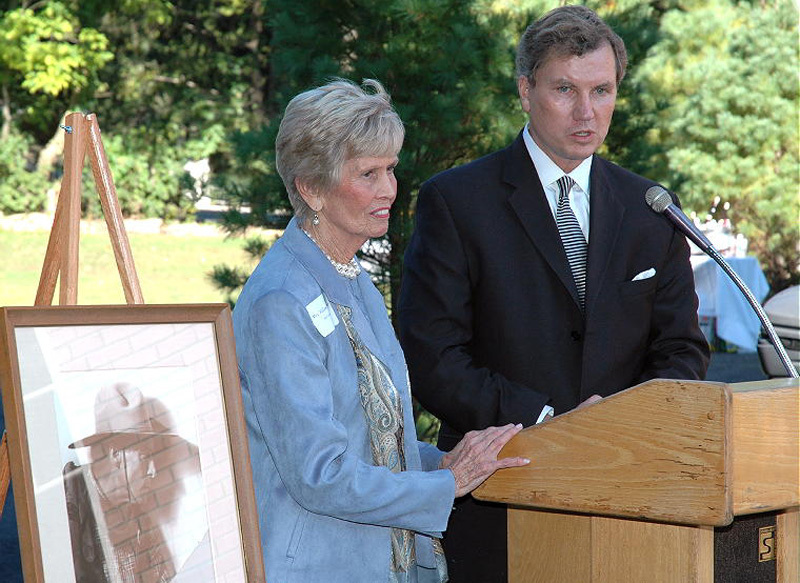 Bill & Mary Ellen Hart Endow Connecticut Humane Society's Westport Animal Shelter. Oct. 1, 2004 — Decication ceremony as the Connecticut Humane Society renames its Westport animal shelter for the late Mary E. Hart, sister of onetime Westport resident William S. Hart. Accepting a gift from the society's president, Richard Johnston, on behalf of the Hart family is Westport resident Beatrice "Tulipe" Traber, granddaughter of Frances Hart Bierck (Bill and Mary Ellen's sister). Tulipe was born Beatrice Hogenwoning (daughter of Beatrice and Bram); she was married to James R. Cochrane at the time of Frances' death (see above) and later married William Traber. (Although sometimes spelled "Tulip" in news articles, her name appears as Tulipe in vital records.) Great-uncle Bill Hart's photo is a left. Photo: WestportNow.com. Click to enlarge. — Biographical info: Tricia Lemon Putnam. One of the marquee Broadway stage stars at the turn of the nineteenth century, [William S.] Hart made his name in Shakespearean drama only to switch to celluloid westerns and become an equally bright star of the silent movie era, earning as much as $3,000 a week. Forsaking Manhattan in 1907 for a little peace and quiet, Hart moved to Westport and became a conspicuous figure about town, especially on the porch of the old Westport Hotel where he would hold court. Hart's burgeoning career eventually forced him to relocate to California, but he remembered dear old Westport in his waning years in the form of a $100,000 bequest made on behalf of his sister, Mary, to establish the Westport Humane Society.